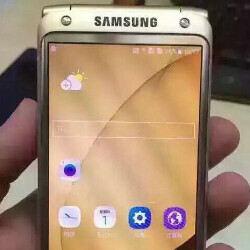 Samsung's high-end Android Clamshell poses for even more pictures; phone to be released next month? We've been showing you plenty of photos of Samsung's Android powered high-end clamshell model. The SM-W2017 has been given the code name Veyron. It carries a 4.2-inch screen with a 1080 x 1920 resolution. Under the hood is the Snapdragon 820 chipset, which carries a quad-core CPU and the Adreno 530 GPU. 4GB of RAM is inside along with 64GB of native storage. A 12MP camera adorns the back, while a 5MP front-facing snapper handles selfies and video chats. Believe it or not, this is a clamshell with a fingerprint scanner, a 2000mAh battery, an always-on screen and Quick Charge 3.0. Android 6.0.1 is pre-installed. No, this is not your Granny's clamshell phone. Not only is it a high-end smartphone, it is also reportedly a high priced one as well. The SM-W2017 will have a hefty price tag marked at the equivalent of $1498 USD according to one report, which claims that Chinese retailers have been receiving stocks of the unit in advance of an early October release. While we'd love to see the device get a shot at the U.S. market, it would appear that for the moment, the SM-W2017 is heading for a Chinese launch only. That seems a bit short sighted on Samsung's part since there are plenty of former clamshell users who would love to see an Android powered unit with this form factor. I want those old slide phones or swivel phones to come back too.